The next step in efforts to help fill the widening gap in housing for workers and families is set for Monday, as the Dare County Board of Commissioners will hold a public hearing on a series of zoning changes. Amendments involve establishing minimum lot sizes for duplexes, multifamily housing densities and accessory dwelling units. They also identify the zoning districts where the changes could be allowed. Following a proposal from The Outer Banks Chamber of Commerce and review by the Planning Board, the proposal for unincorporated areas of the county went to the Board of Commissioners Oct. 1. “The revisions are not designed to encourage construction of units for short-term vacation rentals but to address long-term occupancy with no associated income qualifiers such as those found in the Family Housing Incentives Standards,” Planning Director Donna Creef said earlier this month. Under the final proposal developed by Creef and her staff, duplexes would require a minimum size of 15,000 square feet for lots served by central water and 20,000 square feet for those with private wells. The Planning Board said that seemed appropriate since the impacts of a six-bedroom, single-family dwelling are no different than a duplex with three bedrooms in each unit. A total of 25 zoning districts would be affected by the amendment, except R-1, which is composed primarily of residential neighborhoods that have homeowners associations or various restrictive covenants. Multi-family dwelling densities would be expanded by two additional units per acre, ranging from 6 to 10 total units per acre depending on the district. The changes for accessory dwelling units, or “mother-in-law suites,” included in the proposal do not go nearly as far as the Chamber requested. No size limitation adjustments will be made in Wanchese, Manns Harbor and East Lake since those communities agreed on a 50 percent limit during development of zoning maps years ago. Other areas would see limits of 50 percent of the floor area of the principal use structure not to exceed 1,200 square feet. In the proposal presented to commissioners, Creef said that a size limitation is a common feature in regulating ADUs, usually expressed as a certain square footage limit or a percentage of the square footage of the primary residence. The Planning Board’s recommendation for the other districts restricts lot coverage for ADUs to accommodate 1,200 square feet not to exceed 38 percent, which is the equivalent of 1,200 square feet added to 30 percent lot coverage for a 15,000-square-foot lot. Recent stormwater and drainage issues were also noted in making the lot coverage recommendation. The report to commissioners estimated 389 parcels covering 2,046 acres could become available for duplexes, and 905 parcels making up 788 acres could be able to have ADUs. One oft-cited concern with ADUs is how to keep them from being used as short-term vacation rentals. Similar practices have eliminated a large swath of available “apartments” in the northern beach towns, and has helped fuel the housing crunch. Creef said that while some other local governments have tried to keep this from happening, enforcement will be challenging. She has drafted several ideas but noted that linking ADUs to owner-occupancy of the principal use structure has been ruled unenforceable by the state courts. In closing, Creef said she sees the amendments as a positive step in addressing the housing needs of unincorporated Dare County. Another notable issue in the entire discussion up to Monday’s meeting has been leaving out R-1, R-4 and RS-1 zoning districts from several of the recommendations. Much of northern Roanoke Island outside the Manteo town limits is zoned R-1, allowing for just low-density, residential housing. Because, in some cases, residents and homeowner association leaders in those zoning districts have been less-than-warm to the ideas presented by the Chamber and Planning Board, that appears to greatly reduce opportunities to expand housing in Dare County’s unincorporated areas. Those areas also have restrictive covenants that would override the changes being proposed for other districts, even in neighborhoods that don’t have active homeowners associations, Creef said. 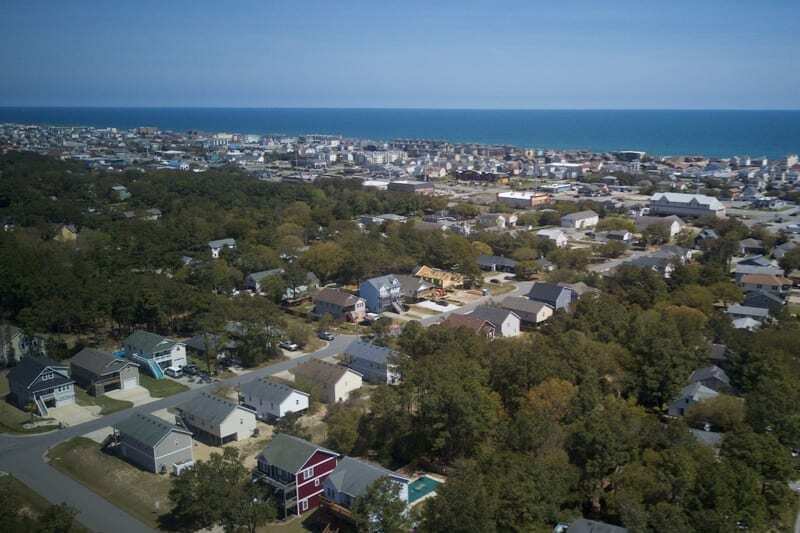 And while the county is working to address the problem im its jurisdiction, the overall attack on the Outer Banks housing crunch would seem to be disjointed at best as there have been no formal talks between county and municipal leaders. There is limited space in many of the towns that could even be considered for higher-densities like what the county has proposed, according to County Manager Bobby Outten. Creef added the towns have focused on being more single-family oriented in their development. Kitty Hawk and Duck are the only Dare County towns to recently make any serious moves toward changes to allow more building options. Board members complimented Town of Kitty Hawk leaders on Oct. 1 for their adoption of changes to permit ADUs. The county’s changes are considered an initial step that could cover a broader area in the near future. “We need to see how the amendments function before taking the next step,” Creef said during Monday’s presentation. Outten said that working incrementally can prevent long-term problems if the zoning changes don’t work or cause unforeseen issues because having to “back-up” would create major problems. The public hearing is scheduled to begin at 5:30 p.m., in the Commissioners Meeting Room at 954 Marshall Collins Drive in Manteo. Comments can also be made via an interactive video link from the Fessenden Center Annex located at 47017 Buxton Back Road. Looks like we’re in for nasty weather in northeastern N.C. Forecasters are issuing advisories for severe thunderstorms, damaging wind gusts and isolated tornadoes. Flooding and high surf are also possible. Winds could exceed 55 mph along Hatteras Island. The move was the result of pushback from a Hatteras Island precinct official and a decision by the Dare County Sheriff’s Office to withdraw its offer to shuttle flash drives and poll workers to election headquarters. The 29-year-old driver of the vehicle was stranded after climbing through a sunroof, according Currituck County Fire and EMS Chief Ralph Melton. The car had floated for about 15 feet before starting to fill with water. This plan will only allow the unscrupulous builders to put up multiple density homes that will be used for rentals. Ocean City and Delaware are fine examples of that problem. The people that need the help will never see it. Higher density housing brings more people, more traffic, and more crime. In a resort area it will only help create more rentals for the tourists to use while farther pricing out those it intends to help. There will be no way to enforce it that will not be challenged in court. I fully expect the county to capitulate to the wants of the Chamber of Commerce, Tourism Board and developers. The developers are the only group that will benefit from this. @Wary, you are correct. Instead of charging thousands for the big house rentals, they’ll charge hundreds for these smaller homes.